After the disappointments recounted yesterday, I want to end the review of our little spin weekend on a high note. Yarn with beads in it is mega cool stuff, almost universally expensive, and gorgeous nigh unto irrisistability. Tilli Thomas and Art Yarns are among the most mainstream producers of such goodies, and they are on the very highest end of specialty yarn. 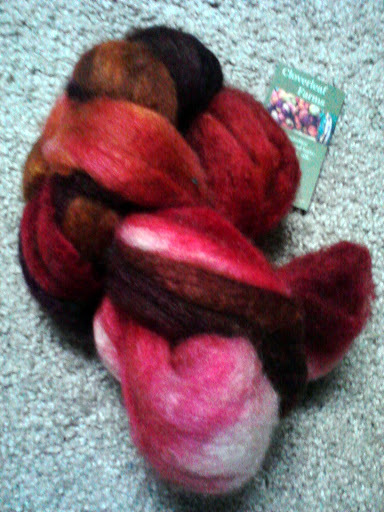 The only other access to such delights is handspun. And by golly, I was going to try it. I pulled out a gem to be the main ply; 2 oz. of completely gorgeous merino/silk acquired (evidently) from the Cloverleaf Farms booth (I’m pretty sure that link is the right Cloverleaf Farms; the pictures of her display of top looked the same). I split it in half and dashed it off into completely gorgeous singles in no time at all. I was spinning thick and thin, semi-woolen, and fast; this top was loose and open, so it was easy as pie. Next, I took the ample leftovers of white singles I had spun up for the horrible tailspun, and endowed it with all the leftover beads from Rachel’s Tears. I have no idea where my beading needle is, so I just threaded a regular sewing needle with sewing thread, tied the thread to my yarn, and off I went. I spaced the beads about 2″ apart, which meant I had to continuously slide the rest of the beads down the single. Predictably, this led to a deal of breakage and frustration. This also meant that I could only put on as as many beads at a time that I could slide down without too much headache. If I do this again, I will put the beads on a thinner, more stable yarn; maybe even a thread. This is a very effective way to eat up beads in a hurry. I was only a third of the way through the red singles when I ran out, so I spun the rest of it together. The result – two glorious little yarns, probably heavy-worsted-to-bulky-ish, about 60 yards each. Sizeable in girth, but delicate in composition. I am in love, but you probably knew that. It’s hard not to love something that has passed through your own fingers so many times, especially when its final destination – a garment – remains a mystery of potential. And this was so easy! I should over-order beads every time, so I can make more fun stuff like this. It’s a lot less work than knitting with beads, let me tell you. This brings the recounting of our spinning retreat to a close. Appearances to the contrary, I have been knitting… and more. Much of it is still on the DL, as I have an unaccountable aversion to showing future designs while they’re still WIPs. At least for “the series,” as its come to be called around here. But there’s other knitting on the go, a bit, and we’ve been gardening, and enjoying things like sunshine. Speaking of sunshine, happy solstice! Engage in some redeemed paganism. I think I’m going to go sit on the porch, under the dappled light through the maple, and read Sigurd and Gudrun and Made from Scratch. I tried so hard to make beaded yarn recently. On the spin retreat, I started some singles out of Neighborhood’s BFL. At home I finished 2 full bobbins. Using thick gold thread, I threaded enough beads for what I judged (after much weighing and calculating) for 1/4 of each single. But my gold thread scrunched together as I was pushing the beads down. It was pretty quickly ruined. I didn’t have a good thin yarn that I thought would be the right color for my singles. So….sigh…..I figured, hey, I’m still a beginner. It’s OK that I failed this. I’ll just add the gold threat without beads. Well it looks nice! There was only enough for 60 yards of it. And I simply 2-plied the rest for another 450 yards…..the gold threaded stuff will make a nice edging for my project. For me, the lesson I learned was that the color and weight of the stuff that holds the beads is really important. Get the right materials together next time.